Kidush Cup and Plate Set CAT# CU- 8. Size: 5.7” X 4.5”. 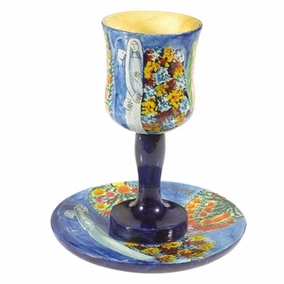 Each cup and plate is hand – painted with a brush using acrylic colors and then lacquered. The cup can be used for drinking and also be washed by hand in water since it is coated with several layers of lacquer. .In the absence of wine or grape juice, the Friday night kiddush may be recited over the challah; the blessing over bread is substituted for the blessing over wine. In that case, the ritual hand-washing normally performed prior to consuming the challah is done before the recitation of kiddush. Some groups, including German Jews, follow this procedure even if wine is present. If there is only sufficient wine or grape juice for one kiddush, it should be used for the Friday night kiddush.In many synagogues, kiddush is recited on Friday night at the end of services. This kiddush does not take the place of the obligation to recite kiddush at the Friday night meal. When recited in a synagogue, the first paragraph (Genesis 2:1-3) is omitted. The text of the Friday night kiddush begins with a passage from Genesis 2:1-3, as a testimony to God's creation of the world and cessation of work on the seventh day. Some people stand during the recital of these Biblical verses (even if they sit for kiddush), since according to Jewish law testimony must be given standing.There are different customs regarding sitting or standing while reciting kiddush depending on communal and family tradition.